Our air conditioner installation won’t leave you guessing about whether you are getting great results in Troutman. If you have an old and outdated air conditioning unit, or if you are considering your options for an AC upgrade, make sure to give our team at Cool Comfort Heating & Air a call. 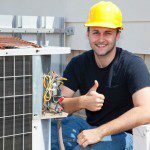 Not only is it important that you choose the right unit for your needs, but it’s also crucial that you have professional air conditioner installation to make sure you get the most from your new investment. Our experienced team will ensure that your new air conditioner unit fits your requirements for comfort and energy efficiency, and our air conditioner installation won’t leave you guessing about whether you are getting great results. There are several important steps we take during air conditioner installation that will ensure you get the best results. Not only will be ensure that all components of your new unit are present and working well, but we’ll also make sure your unit is properly connected to your ductwork and ventilation system. Trying to complete these steps on your own could present problems, especially if you don’t have the proper tools or expertise to connect your new unit. By relying on us at Cool Comfort Heating & Air, you never have to worry that your air conditioner installation won’t produce great results. Give us a call at Cool Comfort Heating & Air today to schedule your air conditioner installation for your home in Troutman, North Carolina. We are authorized Trane dealers, and we can help you select and install the system that will work best for your home and your family. We look forward to serving you! At Cool Comfort Heating & Air, we provide high-quality air conditioner installation services in Mooresville, Huntersville, Cornelius, Denver, Troutman, and Davidson, North Carolina.